Hakama are a great and easy set of pants to make, and period (the period ones usually have a piece of wood in the back to help support it, but I find that the hakama do not need it) alternative to the normal wrap pants. 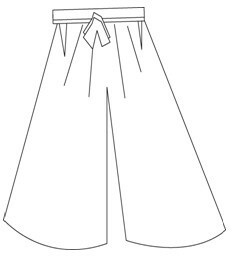 You can place these over jeans or shorts and they keep you warm (because you can layer it in these huge pants) or cool in the summer (a pair of boxers or shorts only underneath them as they will stick out on the sides at the triangle if you do not wear a kimono or shirt tucked in. 1 Flat Twin Sheet. (approximately 4 bucks at Walmart) or approx 3 yards of fabric Thread of the same color as the fabric. Open and unwrap then wash and dry the fabric. This makes sure that any shrinking will be done before the fabric gets sewn. Second, open the fabric so it is full length on the floor or table for cutting. Cut off the finished and hemmed edges of the fabric, including the sides.